It hurts me to write this. For years, musicians have been struggling to find a good microphone for home recording. ...they also end up using some of the cheap condenser microphone available out there. These are the questions I get asked all the time. If you have the same question, I’m glad I’ve answered it in this post. There’s one big problem, even if I happily suggest you the ‘best microphone for singing’, there’s one question still looming around. Most of us keep looking for a lot of stuff online and tend to get confused. Taking this into account, I’ve listed the Top 7 Vocal Microphone, which I believe will make your work a little simpler, and help you in buying the right mic to record your beautiful voice and even musical instruments as well. Talking about the smallest condenser microphone out there? Well here’s the Holy Grail. To be honest, Shure’s MOTIV MV88 isn’t the first condenser mic to be so small. There are plenty of options from brands like Zoom, TASCAM and Blue that connect directly to your iPhone’s Lighting connector and lets you record music. However none of them stands out and happens to be only marginally better than your mobile's onboard mic. Shure MOTIV MV88﻿ on the other side, sure as hell does the job very well. Its small footprint, allows you to practically take it wherever you go. Since it’s a digital stereo condenser microphone, it happens to have plenty of settings to play around with via the Shure’s MOTIV App. This app allows the mic to show support for plenty of polar patters like: Cardioid, Omni, Stereo and so on. It also lets you adjust gain and record audio in High Resolution format. Trust me, being so small; you can record an entire song on it, as demoed by Shure in the video below. Though I wouldn’t recommend you to assume MOTIV MV88 to be replacement for a standard condenser microphone, however it definitely happens to be an excellent add-on if you’re on the move and can’t take your mic along with all the other accessories with you. For the price, the box looks very basic and toned down to say the least. You just get the mic along with a hard shell carrying case and small foam-based mic cover. Rode happens to be a well-recognized brand in the audio industry. They’re responsible for pulling out some of the best microphones out there from their hat. If you get a microphone with Rode written on it, it certainly won’t disappoint (unless you’re shipping them off of China). Rode NT USB Microphone happens to have a bubbly design and setting it up is its easiest part. Just plug the mic into your PC’s USB port and you’re good to go. Rode NT happens to be a looker, seriously! It happens to have a small profile and can easily sit on your desk without purring for more space. Well the mic is great, but what’s greater is it’s package content. Definitely! I love it, and you would too. Basically the box looks big and the packaging is premium for its price too. Inside you get the microphone itself along with a Rectangular Pop Filter attached to it. The pop filter happens to be one of a kind, and instantly matches to the size and shape of the microphone. Moreover you have a three-leg table stand with rubber feet that forms the Rode NT’s base, you also get a faux leather carrying pouch and a fairly large 20 inches USB cable. To be honest, you just do not need to get anything aftermarket; considering the accessories you get in the box. It will suffice all your needs; if you need the best microphone for home recording. Do check out its full review here. Talking about its vocal performance, let the video (embedded below) speak for itself. Unlike the other few mics mentioned in the list, Rode NT only comes with Cardiod Polar Pattern, and trust me 95% of the time you’re going to use the same, even if you have a microphone with multiple polar patterns. There are high chances that you haven’t have heard about this audio brand called ‘Apogee’, as I personally got to know about it just few months ago. Being new, it certainly is really sort of extra ordinary. The brand specialises in developing professional audio devices that can be instantly connected into your iPhone, iPad or Mac. Apogee MiC 96K is no-hassle-to-use and best vocal recording mic in our list. 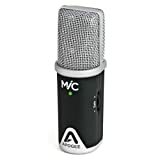 If size is your concern, you shouldn’t be worried then; as Apogee MiC is one of the smallest standard-sized vocal microphone in our list; with a very small footprint. It can sit anywhere you place on your table comfortably. Manufactured in USA, expect it to have a strong build quality, and it really does. Made entirely out of metal, this condenser mic feels sturdy in the hands and is highly durable. Do check out its full review regarding built quality and performance. On the side you have a ‘gain control’ knob that lets you adjust voice gain on the go. It allows upto 40dB of gain. Moreover the 96K in the name presents that this mic can record sound upto 96,000 kHz 24 bit audio; that takes it into the high resolution audio recording range. Though being so small in size, this one is an excellent performer. You can take this one wherever you go, and start recording whenever you want. Included Lighting and USB cable; allows you to connect it to your iPhone, iPad and MAC quickly and efficiently. You also get a small tripod stand to place this mic on it. I would have preferred; if they could have added a headphone monitoring jack, as it makes working on audio recording so much simpler. However attaching big studio sized headphones to such a small mic, would have made things a little messier I guess. AKG C214 is the costliest mic in our list of best microphone for home recording. It happens to have a retro look, which is very much evident at first glance. Before we talk about the mic, let us talk about its package contents. For the price, the package is totally brilliant and looks completely expensive. It comes in a rigid metal-built briefcase-like box that justifies its price 100%, compared to other mic in our list that all come in cardboard packaging. If you’re a girl, you can even use this box to store your makeup products, as the box is definitely built to last. Enough of the box, now let’s take a peek into what’s inside. You get the microphone itself along with a strong and rigid shock mount, and a rectangular foam cover for the mic. The mic, along with the box and included accessories look extremely premium and justifies the price. Coming to the mic, it has an XLR connection and you’d be required to buy an XLR cable and a﻿udio i﻿nter﻿fac﻿e to get it running. Hence you can’t run it out-of-the-box without the XLR cable. It has a rather dull looking matte grey blue color, and looking at it doesn’t feel good, it rather feels boring if you ask me. It has a 25mm (1 inches diaphragm) that is sensitive enough to pick up intricate depths in your voice. 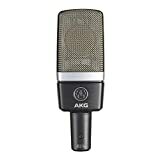 AKG Pro Studio C214 happens to be the best studio microphone for recording vocals and music instruments. Do check out its full review. I personally like the draped in black look of Audio Technica AT2050. This might sound funny; however I feel that AT2050 looks like the gentlemen of all mic featured here, with its matte black finish and an irresistible-to-hold design. For starters, this is a multi pattern condenser microphone that supports Omni-directional, Cardioid and Stereo (Figure 8) switchable Polar Patterns. For the price, the box looks very simple and nothing sort of fancy... this doesn’t help in giving a premium feel considering its price. Anyways, inside the package you get the Audio Technica AT2050 Condenser mic itself along with a leather carrying pouch and a shock mount. Now coming to microphone, it has a very rigid outer body build and in the hands it feels sturdy instantly. However, you wouldn’t want to drop it (even by mistake) as the diaphragm inside it happens to be delicate and might fall apart. For normal use, it just won’t give up on you easily. Technically this is a side-address microphone; hence if you’re recording vocals, you’d need to speak to the side of this; rather than on the top. At the base of the microphone you have a polar pattern toggle, if you move to the sides, you’ll find two more switches for 80Hz High pass filter and 10dB pad; both of which help in reducing unwanted background noise. Recording vocals on this one happens to be a joyful experience; it records the deepest bass in your voice if you’re male and crispier highs if you’re a female. Since it’s an XLR microphone, you do need to get an aftermarket XLR cable and Audio Interface to get it working out of the box. Coming straight out of Shure’s MOTIV series, similar to the previously mentioned MOTIV MV88, the MV51 is an innovative condenser microphone that is a great mic when it comes to recording vocals and musical instruments. One of the standout feature of Shure MOTIV MV51 is its touch based functions below the mic’s diaphragm. Just like the previously mentioned Shure MOTIV MV88, the MV51 is easy to connect and helps you record audio on the go. Noticeable from its size, the Shure MV51 is a large diaphragm condenser microphone that includes a 25mm diaphragm inside that picks up the deeper nuances of your voice. To be honest, the MV51 is a looker. If you need a best microphone for singing that also acts a style statement, this one won’t disappoint though. Getting towards its USP is its capacitive-touch based control panel. You can control gain, mute audio and toggle between various presets via this touch sensitive control panel. It also has indicator for headphone monitoring. At the back you have two ports, one for connecting your headphone so as to get active headphone monitoring, the other being a USB port that provides power and lets you connect the MV51 with your PC or MAC. At the back you have a small leg for support, which the brand calls as ‘rear kickstand’; you can also unscrew the kickstand’s rubber feet and connect it to a mic stand for recording vocals or instruments. The package also includes a micro-USB to Apple Lightning connector, allowing you connect the MV51 directly into your iPhone and iPad, and record audio straightaway. Well how can our list of Best Condenser Microphone for Recording Vocals be complete without including the holy grail of all condenser mic and i.e. the Blue Yeti. 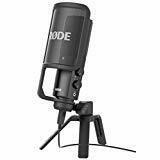 For our specific use we have the Blue Yeti Pro that includes the USB input along with a much professional XLR input. The Blue Yeti Pro retains all the pros of the original Blue Yeti and then happens to be much better version altogether. Blue Yeti Pro is definitely a step up compared to the original Yeti, with being more sensitive when it comes to recording intricate details and cancels out a lot of external noise. The new circuitry inside offers excellent performance compared to the original Yeti and justifies its price that happens to be double than that of the original. Well most companies shy away from including an XLR cable in the box, I’m glad that Blue addresses this problem and does include the XLR cable along with a USB cable. It has support for an extremely high resolution 192kHZ/24 bit audio recording. You have four controls on the mic itself. One for the selecting between multiple polar patterns; while the other include for Mute Button, Gain Button, as well as volume controller. You also get a headphone jack at the bottom for those who require a zero-latency Headphone Monitoring. There aren’t much cosmetic changes between the Blue Yeti and Blue Yeti Pro, as they look totally identical except for the color change and an extra XLR input in the Pro. However there are greater changes in the internals of this microphone. Check out Blue Yeti Pro full review. Rubber feet at the base; absorbs vibrations and helps the mic in not picking it up.